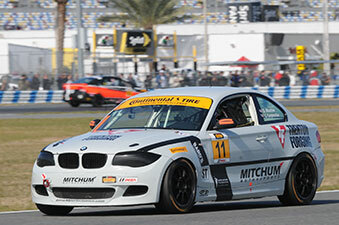 Grosse Ile, Michigan (27 January 2014) — Dane Moxlow and Lee Carpentier teamed up to debut the #11 Trenton Forging/Mitchum Motorsports BMW 128i ST car in the IMSA Continental Tire Sports Car Challenge (CTSCC) series last Friday at the historic Daytona International Speedway. Moxlow took to the track and qualified 27th after fighting handling issues in critical areas of the track. When the green flag dropped Moxlow maneuvered his way forward from 27th to 20th before handing the car over to Carpentier. The pit stop and driver change went flawlessly despite the crew and drivers performing it as a team for the first time in real competition. Carpentier grabbed another couple of spots to secure their 15th place finish, setting them up for a chance at the coveted season-long Drivers Championship. Moxlow and Carpentier will take to the track in round two of the CTSCC at the Sebring International Raceway in Florida on March 13th. Follow Dane on Twitter @DMoxlow or on Facebook at “Dane Moxlow Racing” for real-time and trackside updates, and on www.danemoxlow.com to stay up-to-date on all of the excitement. Trenton Forging is a leading producer of custom impression closed-die forgings for a wide variety of industries, including automotive, mining, military, and agriculture. Trenton Forging has the distinction of being one of the first companies of any kind worldwide to be certified QS9000, and the first closed impression die forging company in the world certified QS9000/ISO9002. Visit us at www.trentonforging.com for more information or to request a quote. Founded in 2001, Virginia Beach-based Mitchum Motorsports comes from a variety of professional road racing backgrounds, spanning over 50 years. They are led by team principal Chris Mitchum, who has vast experience from all sides of the pit wall; from professional driving, driver coaching, team management, crew chief, consulting, and mechanic. Since 2010, Mitchum Motorsports has become a mainstay in the Grand-Am/IMSA Continental Tire Sports Car Challenge, with their Chevrolet Camaro GS.R and BMW 128i-ST Programs. The team has also seen numerous Daytona 24 campaigns. 2014 will see the team involved with IMSA CTSCC, and Lamborghini Super Trofeo series; as well as competing in club venues such as: NASA, SCCA, and Porsche Club of America. Mitchum Motorsports is an Official Partner Team with Automobili Lamborghini for the Super Trofeo series. Mitchum Motorsports also specializes in: racecar construction, development, preparation, support, and performance street car service.